APPSC Group 3 Answer key 2017 Download: Andhra Pradesh Group III Panchayat Secretary Screening Test Answer key for SET A B C D with Question Paper Solutions, Cutoff Marks Caste/ Category wise Available From Manabadi, eenadu, Sakshi News Papers and Official website also. Check Below Article to get more information about Group 3 key solutions. The Andhra Pradesh Public Service Commission (APPSC) has recently announced the Group 4 notification for 1055 Panchayat Secretary Vacancies. Huge many candidates interested in APPSC group 3 jobs have applied for these posts. To select the appropriate candidates the APPSC is organizing the written test on 23rd April 2017 in various examination centres across AP. 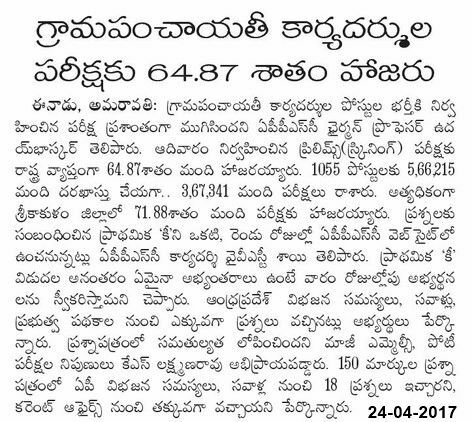 5.66 Lakhs of candidates applied for APPSC Panchayat Secretary Posts are now faced the examination. All the aspirants those have applied for the APPSC panchayat secretary vacancies have to clear this examination to qualify for the further rounds of selection process. In order to attempt the examination candidates must check the APPSC Group 3 Key 2017 From here. Candidates those have applied for AP Panchayat Secretary posts can download the Answer key from the APPSC official website, psc.ap.gov.in. The APPSC Group 3 Screening Test answer key will be accessible in 2 days. So, all the applicants while to the exam verify all the things you are going to take. For more significant details wanted the applicants go through the official web portal. In the website we provided all the latest details of the AP Panchayat Secretary exam you can directly go through the given link. Candidates those who are written can download AP Group 3 Exam Answer key Solutions, OMR Sheet, Question Papers From below. Key & Objections: The Commission would publish on its website, the key, after conduct of the examination. Any objections with regard to the key and any other matter shall be filed with in one week of the publication of the key on the website of the Commission. The objections if any would be examined and the decision of the Commission in this regard shall be final. Any objection filed after expiry of one week from the date of publication of key would not be entertained. MEMORANDUM OF MARKS: Answer key would be published on the website and also as marks of each candidate are also displayed on website, no separate memorandum of marks would be issued. How to Download APPSC Group 3 Panchayat Secretary Answer key 2017? Enter your roll number and given name accurately. Then card appeared on the screen. Save the APPSC Panchat Secretary answer key 2017 file for further use. Note : Objections would be accepted only in writing in the specified format available above, with supporting proofs till 01/05/2017. Late Objections would not be accepted. 1.3 How to Download APPSC Group 3 Panchayat Secretary Answer key 2017?